This story is in development. The article will be updated to reflect any changes that may occur. Latest update was on September 21, 12:31 p.m..
On September 21, Divest McGill, a campus environmental justice group, set up camp at Community Square in front of the James Administration building to ask the University to freeze all its investments in the fossil fuel industry. 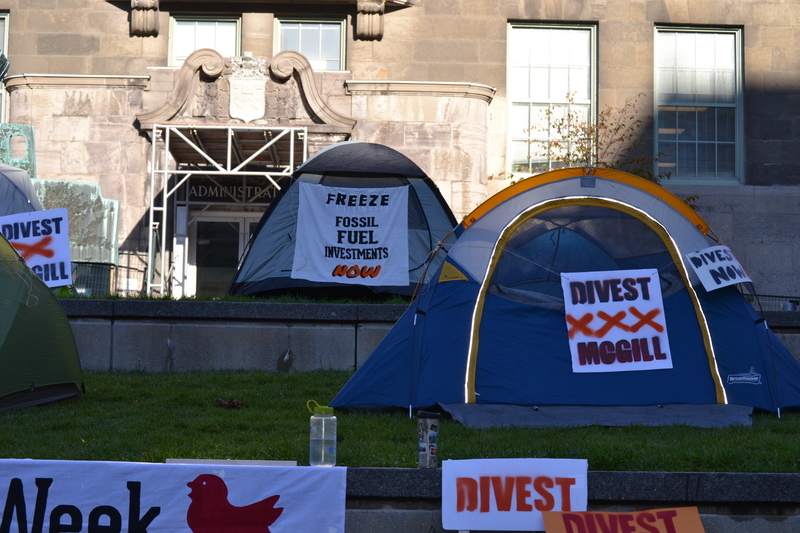 Julianna Duholke, Divest McGill organizer, explained that Divest McGill’s camp will stay in place until Stuart “Kip” Cobbett, Chair of the Board of Governors (BoG), recommends a freeze on fossil fuel industry investments to the BoG. “For the last two and a half years, we’ve been working with Kip and the Board to ask them to completely divest from fossil fuel industries, and on their part we’ve really seen little concrete action,” Duholke told The Daily. Chloé Laflamme, another Divest McGill organizer, also expressed her disappointment with the University’s lack of concrete action with regards to divestment. “The climate crisis is a very, very serious issue that we have not been taking urgent enough action [on]. We should’ve been taking action a long time ago. Even now, the fact that we’re doing this now is late. Our administration is not responding to our calls for action,” Laflamme told The Daily. Dean of Students André Costopoulos explained that freedom of expression and demonstration are protected under the Charter of Students’ Rights. Over the past two and a half years, Divest McGill has been trying to convince CAMSR to accept environmental degradation as social injury. To this end, members of Divest McGill have handed the BoG two petitions and a 150-page research brief on the issue of climate change. Since then, CAMSR has updated its terms of reference to include grave environmental damage in its definition of social injury; however, a clear decision on divestment has not been made. In June 2015, the BoG decided to involve the Royal Society of Canada, a national research council composed of distinguished scholars, to research the potential implications and consequences of divestment. However, according to Duholke, the BoG has changed its mind once again. “They were going to do a study into climate change and whether there was a causal relationship with social injury. They decided to scrap that study after realizing there was already mounds of research on it, which we had presented to them. And now they are just back to simply deliberating,” Duholke told The Daily.